RAPPLER NGA-NGA! Pahayag ni Wikileaks Founder sa News ng Rappler: "Stupidest Article I have ever Read"
Binatikos ni WikiLeaks Founder Julian Assange ang bagong fake news ng Rappler at ayon sa kanya, ito ay isa sa pinakabobong news na nabasa niya. Ayon sa article ng Rappler, tila na ipinahihiwatig nito na may sabwatan at koneksyon na nangyayari sa pagitan ni Assange, bansang Pilipinas at Russia. 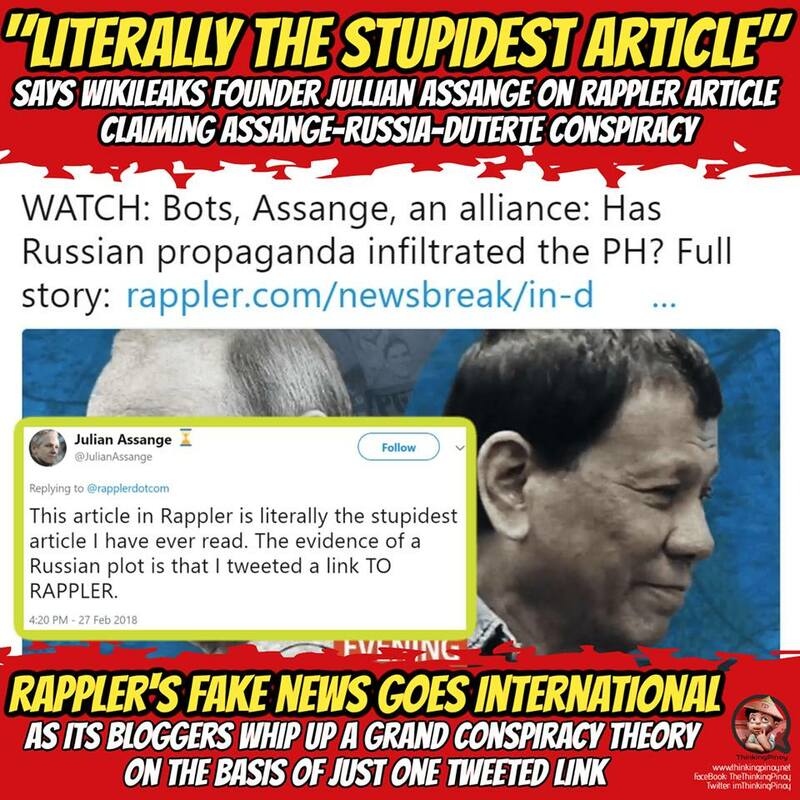 RAPPLER'S FAKE NEWS GOES INTERNATIONAL AS WIKILEAKS FOUNDER @JULIANASSANGE CALLS RAPPLER POST "STUPIDEST ARTICLE [HE'S] EVER READ"
Wikileaks Founder Julian Assange tweeted, "This article in Rappler is literally the stupidest article I have ever read. The evidence of a Russian plot is that I tweeted a link TO RAPPLER." 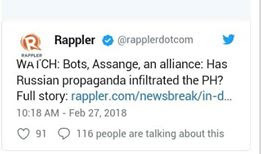 Assange refers to Rappler's latest blog post "Bots, Assange, an alliance: Has Russian propaganda infiltrated the Philippines? ", where the embattled blog site claims that "a Russian-linked Twitter account used to interfere in polls in Spain is now tweeting exclusively about the Philippines. ", insinuating a grand Russia-Assange-Rody Duterte conspiracy. The Rapplerettes describe this as "one of several disturbing developments that may suggest Kremlin influence". 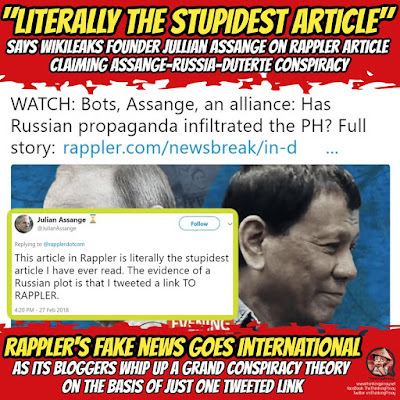 The article's claim of a grand is hinged only on two premises:  that the assailed Twitter account, allegedly with Russian links, is focused on the Philippines; and  that Assange tweeted about Rappler. The twitter account's Russian-links have yet to be definitively established, as it may even turn out to be a piece of planted evidence. Meanwhile, the cited Assange tweet reads "Is Rappler right? ", accompanied by a link to "Contrary to Duterte's claims, Rappler is 100% Filipino-owned, and the CIA is not one of its funders. ", that's it. With this single tweet, Rappler went on to deduce claim after claim like there was no tomorrow. And this, my friends, is why Rappler is going bankrupt: all it's got is fighting spirit, without the brains to match. "ANCIENT ALIENS CAUSED RAPPLER'S DEMISE"
Okong Corbita: If this (rappler) is the kind of media they wanted to represent on battling against press freedom, then Journalism in the Philippines will soon dead.. saan kaya sila kumukuha ng kakapalan ng MUKHA sa pagpapalaganap ng sangkatutak na FAKE NEWS?? Are they being paid by Illuminati or just Maria Ressa and the rest of the Gang are plain jerks?? This is how we call good journalism? Well, Ressa has no credibility at all. Im not even flabbergasted Rappler's futile write ups have been known internationally. Anthony Hermosisima: Madam Sen Grace Poe your pet Journal Rappler nagkalat n naman ng Pekenis na news 😋 Sige tumunganga ka na lang... magaling ka lang sa hearing tulig na tulig na kami sa ka plastican mo. 😏 Buset. Ano to “Duterte tuta ng Russia”? After ng “Duterte tuta ng China” at “Duterte tuta ng Kano” Sunod nyan... since nakipag kaibigan tayo sa India “Duterte tuta ng Indiano” namn ang sunod. Hindi lang pang lokal pang international pa ...hayan ha di nga nagkamali ang govt sa pag ba ban sa Rappler at sa tikling na Pia .. Their Karma is just like a rain u know When it rains it pours..
"Rappler employees went berserk for months of unpaid salaries". "NBI raids Rappler's headquarters, Tons of Undeclared Fake News Found"
"Pia to join Comittee on Disposable of Garbage and Refuge headed by Leni"
"Fake News blogger Jover Laurio Found Alive In her Apartment Today"
"Hollow Blocks Shortage, isinisi kay Roque, Limang Senador, na Head Trauma"
"Pnoy, mas pipiliin ang magpapatuli kaysa maturukan ng Dengvaxia"
Pia, nagpa haircut at facial, nag allergic reaction at nagmukhang Ressa! Any official statement liberal party? mkpg ipon nga ng bagon ni tarzan at pupunta ako sa kapatagan! haha. Oliver Lee Susara: I will be honest with you guys i did not even know that rappler was a news outlet. I thought it was like the union or something similar. But when this thing about it being shut down then i knew it was a legit news outlet. I feel sorry for the people that swapped their profile photo to the rappler logo, cause they got fooled when rappler cried freedom of the press was being crushed when in FACT it is because of the ownership problem. I wonder what really is Rappler's propaganda. Hindi ako makapaniwalang hindi nila alam how would the general public would react sa mga actions nila. Pati si mga galawan ng Liberal ngayon parang sobrang fail. Tingin ko merong something behind this not just these surfacing intention. Trending Balita: RAPPLER NGA-NGA! 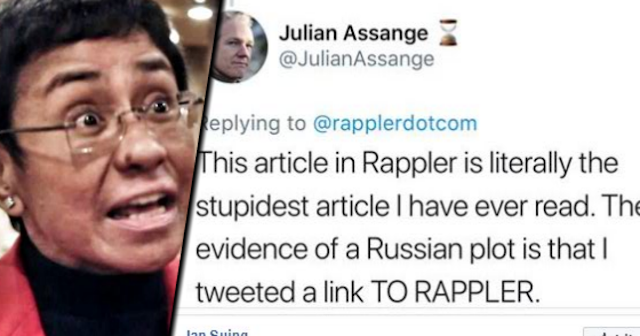 Pahayag ni Wikileaks Founder sa News ng Rappler: "Stupidest Article I have ever Read"